This week the excuses stopped and we finally tackled a job which has been put off for too long. Weather-wise it wasn’t bad and I was able to rope in an additional four, ever so willing volunteers to help me out. Well, maybe not volunteers, I did have to plead a little. 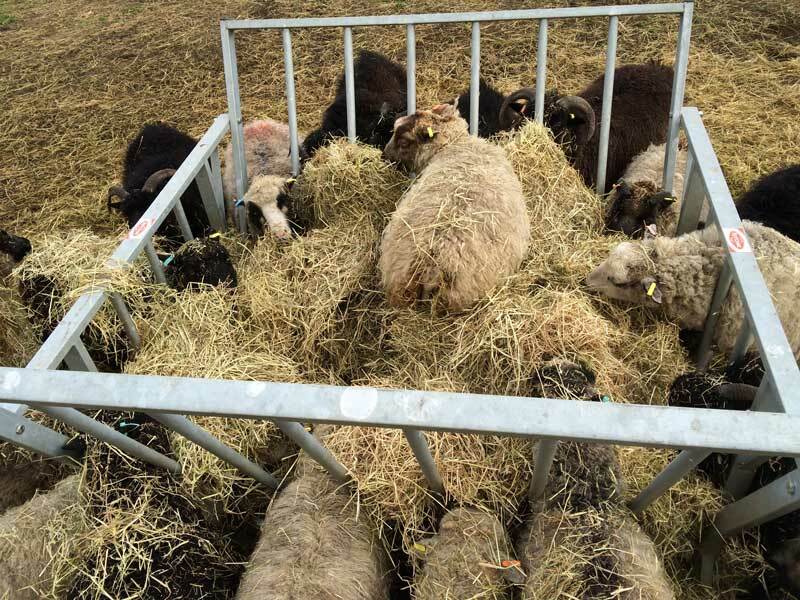 Last year I purchased a hay feeder for the sheep which really was too big for them, but I thought it would save me filling it up as often. But in fact all it did was ensure that on a daily basis, lots of hay was wasted around it. The sheep stick their heads inside it, pulling out hay all the while and in some cases they have been clambering inside, which only adds to the waste. So the end result has been that over winter the wasted hay has built up in layers and each of these layers has just covered over all which had been previously messed on by the sheep. As you can only imagine, after clearing the top layer the smell was horrendous. We managed to utilise an array of different hand tools to get the job sorted and at many junctures I thought about getting a digger in to assist things along, but the sense of achievement we got from completing the job far out weighed any aches and pains gained in the process – at least that is what I kept telling myself. Each day whilst undertaking this ‘little’ chore our merry band of volunteers were banned from going anywhere near the house. Food was brought out to us and we had been instructed to stand at an agreed safe distance away, until they had left the area. At the end of each day, before being allowed into the house, those who were staying had to strip off at the door and make a dash, up the stairs to the bathroom for a nice long hot shower, before we could mix with any other residents. I did draw the line at being hosed outside at first though. But really this was quite a bonus for me. With a house full of women I am invariably down the priority order for use of the bathroom and so to be in there before them all was actually quite a thrill I can tell you. I am now even considering seeking out more smelly jobs on a regular basis, in order that I can balance things out around here. If that was not enough to deal with for one week then an extra couple of spanners were thrown into the mixture, seemingly just to wind me up even further. Firstly, and I promise I was only eating lettuce at the time, I manage to lose one of my crowns. I was never going to go half measures on this and as it turned out it was one of my front teeth. I immediately got myself to the dentist to get it sorted out and thankfully, sort it they did. I couldn’t continue looking like a reject from the Hammer House of Horrors could I? Secondly, after day one of clearing the muck pile, Wendy decided that she would hose all the boots down and unfortunately this meant that my wellies were consequently filled with water and I had to resort to alternatives. So, for the rest of the week I had to complete the job looking like ‘Coco the Clown’ with these whopper wellies flapping around my ankles, never a good idea.